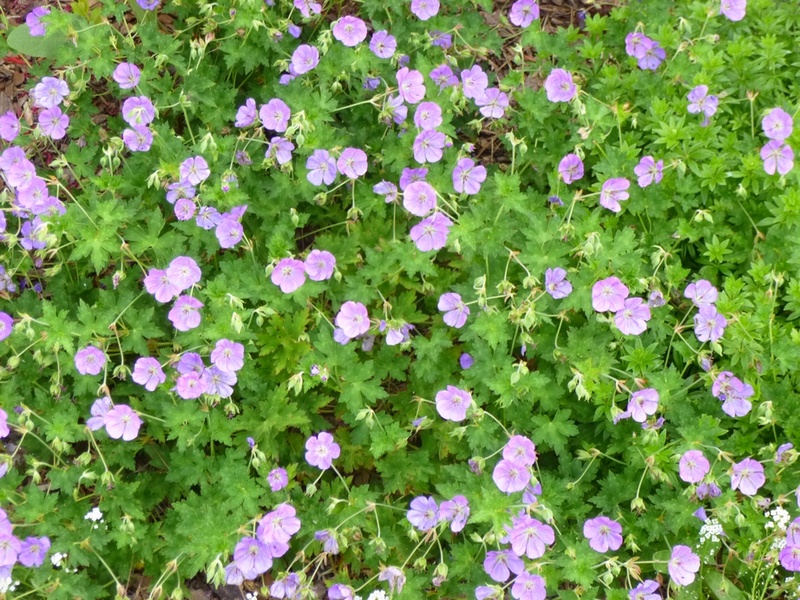 - Don't recall seeing hardy geraniums on many lists of drought-tolerant or heat-tolerant plants, but Rozanne survived the brutal heat and drought of 2012 (with supplemental water in full sun) and I have to think they'll be fairly tolerant of both drought and heat in a spot with afternoon shade. - Not a con necessarily, but just be aware that foliage may scorch in hot climates in full sun. At least that is what happened with Rozanne in 2011 and 2012. She's much happier now in partial shade as you can see from the blooms. - Rozanne is herbaceous. That means the whole plant dies back in winter, which can leave quite a hole in the garden seeing as Rozanne is a sprawler. Not sure yet if my two other hardy geraniums - G. cantabrigiense 'Biokovo' and G. sanguineum 'New Hampshire' - will perform the same or if they'll be evergreen or semi-evergreen. I can say that so far both are much tighter in their growth habit. - Can't see much in the way of pollinator action from bees, wasps or hoverflies. There are some little insects that buzz around the flowers, but they don't seem to land much. I think they may just be in the vicinity while visiting the Sweet Alyssum. Or maybe they visit at night when I'm not looking? - Not native to the U.S.
- Reported to have moderate drought tolerance. With limited supplemental water, S. officinalis seemed to handle TN heat and typical summer drought with aplomb. - Long bloom season. Started sending up flower spikes in late June and was still blooming into September. Flowers are reported to provide nectar to bees and butterflies, but unfortunately I didn't see much activity on the Hummelo flowers. - Foliage is dense enough to suppress weeds. - Reportedly needs some afternoon shade in hot and humid summer climates, so no dice if you're looking for a full sun groundcover. - Supposed to spread by creeping stolons to form a groundcover, but so far in its first year has acted more like a clumper. But you know what they say sometimes about groundcovers and vines - first year they sleep, second year they creep, third year they leap! So we'll see what happens in years to come. On the bright side, at this point it seems like it would be easy to keep under control. - Not native to the U.S. Originates in Europe, Western Asia and North Africa. 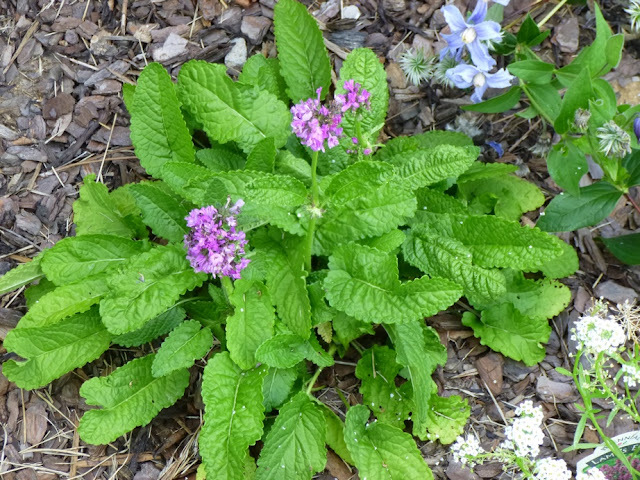 I can't say anything bad about Betony, but I don't think it really stands out in the garden yet. Perhaps as it gets more established in the garden, it will have a stronger presence and make more of an impression. If it starts spreading a little further and attracting pollinators, I'll definitely become more enthusiastic. 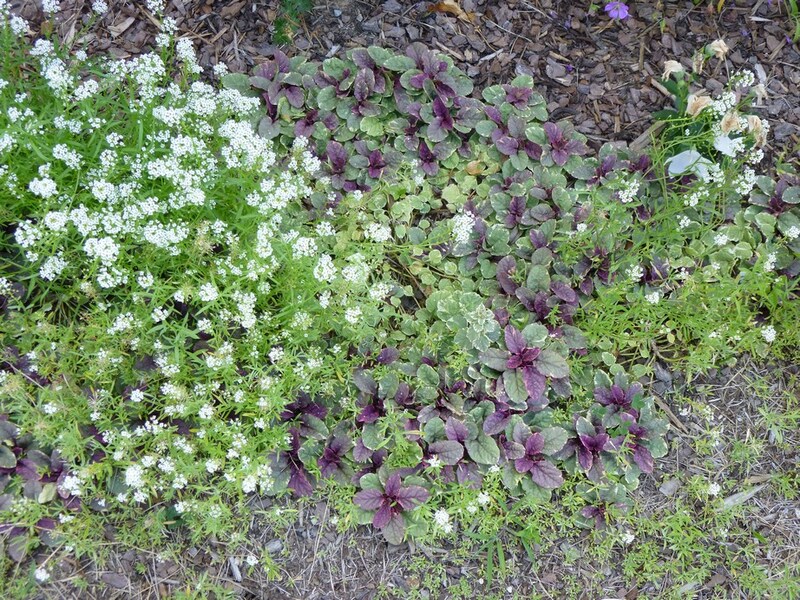 The variegated ajuga in the front border mixes nicely with some Sweet Alyssum while blocking out most weeds. - Pretty and long-lasting (at least several weeks) spikes of flowers in the springtime. 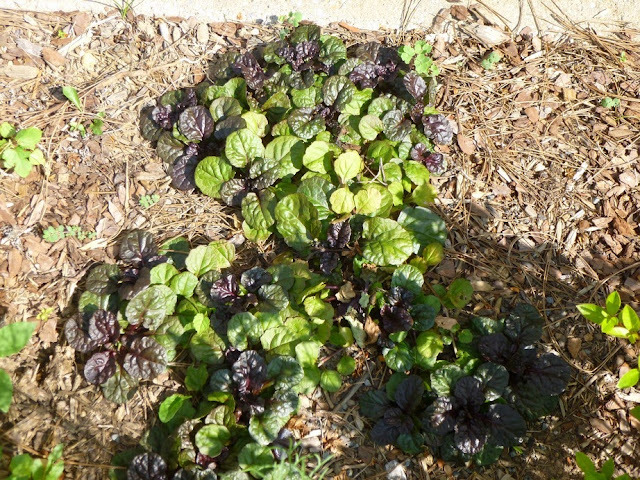 UGA lists Ajuga as a good bee-forage plant, but I did not see any bees on the flowers during our (cold, wet) spring. Other sources say Ajuga can attract hummingbirds and butterflies. I didn't see any of those on the flowers either. Sigh. - Grows in sun or shade. 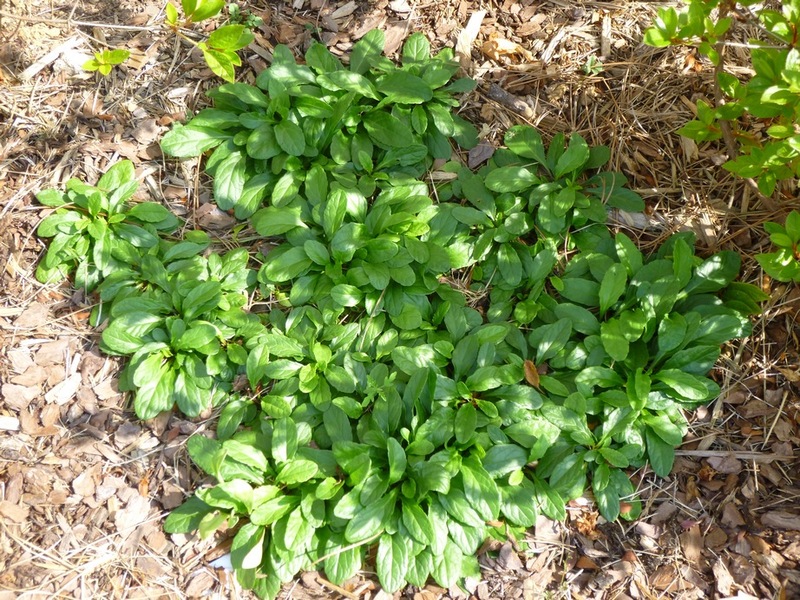 I have one patch growing in sun, but the patches growing in afternoon shade seem much happier. - Does not really need any maintenance. Some sources recommend cutting back the flower stalks after the bloom is done. As far as I can tell, that's only really 'necessary' for aesthetic reasons. If you don't mind the spent bloom stalks sticking up until they fall over (and I don't) then the plant is basically zero-maintenance. - Spreads pretty quickly. I could see Ajuga perhaps working in combination with Sweet Woodruff to cover large patches of shady ground that would not need much / any mowing or other maintenance. - Not native to Southeastern U.S. Like Sweet Woodruff, Ajuga reptans is native to Europe. - Some sources list Ajuga as being mildly invasive. 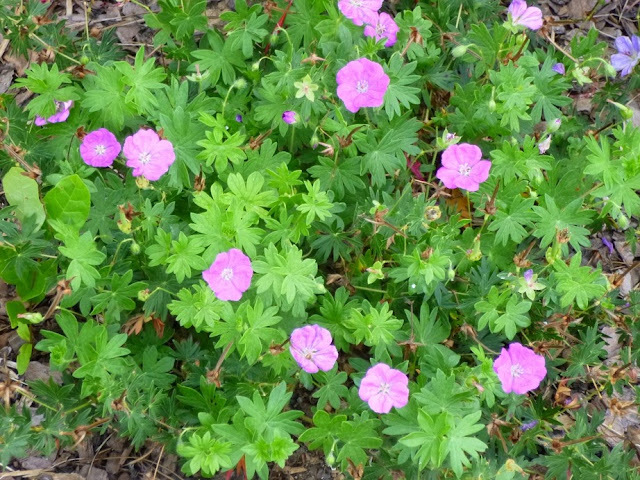 For instance, the North Carolina Native Plant Society has it listed as a "lesser threat". - Also like Sweet Woodruff, Ajuga may technically be evergreen, but that doesn't mean it looks beautiful all year round. In fact, I found the Ajuga looked much more tattered than the Woodruff over the winter. I think slugs like to eat the Ajuga in the cool months, because there were lots of holes in the Ajuga leaves. The slugs didn't cause any mortal wounds and Ajuga has rebounded to look lush and thick in the springtime, but it's not necessarily all that attractive in the winter months. 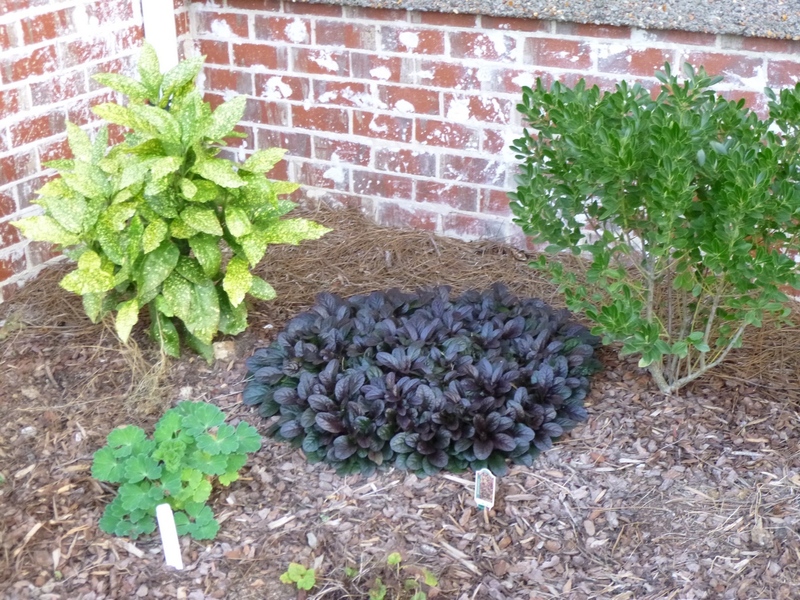 - Ironically, even though Ajuga can be aggressive, it can also have the opposite problem of thinning out in the center. Some sources say that it needs to be divided every 2-3 years to prevent crown rot. I haven't noticed anything that catastrophic, but some of my Ajuga species do seem to be thinning out in the middle. I've read reviews online where gardeners talk about their ajuga dying out in one place and popping up somewhere else. I think my mother had this problem with her Ajuga, where it eventually died out where she wanted it to cover ground and then showed up far away in the lawn or in some other garden bed where she didn't really want it to grow. It may be unpredictable that way. I'm actually pretty conflicted on Ajuga. I can see its merits, but I worry that it is a little too thuggish. 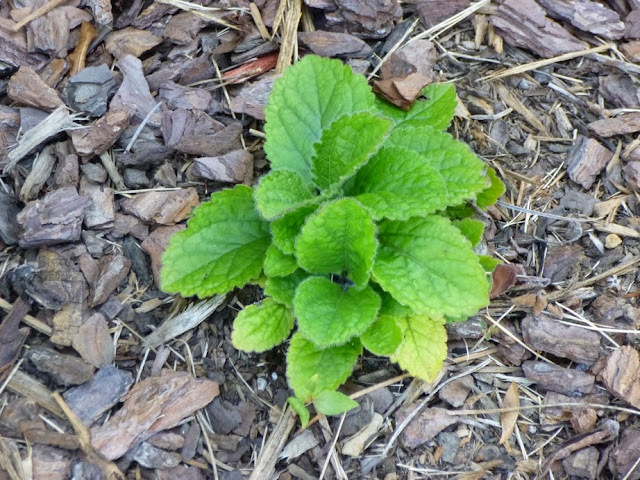 If it were a native plant, I probably would not be too concerned, but since it's an exotic, I worry about what natives it might suppress or displace if it were to spread beyond the garden. The fact that Ajuga is not on many invasive species lists does make me feel a bit more comfortable. That said, all four patches in my garden right now are behaving themselves and performing well. So I'm going to offer a qualified endorsement, but I'll keeping a close eye on the Ajugas in my garden and suggest you do the same in yours if you decide to plant some. One of the neat things about writing a blog is being able to track the stats and seeing which posts are most popular. The two most popular subjects drawing people to the blog so far are searches concerning "pine straw mulch" and "buffalograss". With regard to the mulch, my most recent post on the topic tells how and why I lost my infatuation with pine straw. More recently, regular readers will know that I've begun posting reviews of the groundcovers with which I hope to replace most/all of my mulches. But it's been quite some time since my last post on the test buffalograss patch. The last update was way back in January, when the buffalo grass was hibernating (i.e., dormant) and resembled nothing so much as little gold tufts of straw on a dirt background. So how are things going now? Much better thank you! As you can see from the photo at the top of this post, the buffalograss did eventually green up and has mostly filled in its designated area. It's doing better in some parts of the rectangular test patch than others. I think it's happiest in full sun and has not filled in as much in the section of the test patch that gets a fair amount of shade from a neighboring crape myrtle. 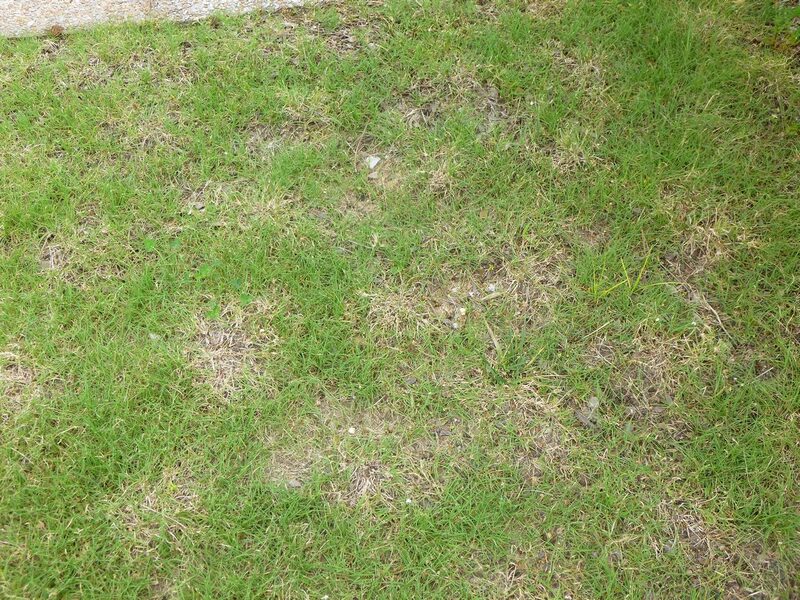 Here's a section of the test patch where the buffalo grass has not filled in as thickly as I would have hoped. The best thing about this patch of buffalograss -- it has only been mowed once. That's right, buffalo grass not only grows slowly, but the soft and tender blades of grass sort of flop over so that they make a nice wavy texture. Even the one time that the buffalograss was mowed, I don't think it really needed to be mowed. Our lawn care guy was mowing the rest of the lawn and I guess he decided to give the buffalograss a trim. To be honest, I liked it better when the buffalograss was a little bit longer. Sorry I don't have that 'before' picture. 1. No need to mow! Near as I can tell, you can skip mowing your buffalograss lawn altogether. Or maybe mow it once or twice a year if you really like a manicured look. That's a major improvement over the typical lawn that needs to be mowed once every week or two from spring to autumn to stay looking nice. 2. Drought tolerant. Buffalograss is supposed to need much less water than regular grass. We've had a pretty wet year so far here in Tennessee, but there have been some warm and dry spells over the last month. The buffalograss seemed to handle the warm, dry weather without any problem. 3. Soft. I remember soft (Kentucky bluegrass?) lawns from my childhood in Pennsylvania, but many of the lawns down here in Tennessee including our own are stiff and rough fescue-based lawns that constantly poke your feet and ankles. Not fun. The buffalograss, by contrast, is feathery-soft and very easy on the feet. 4. Fills in, but does not run rampant. The buffalo grass spreads above ground by stolons, so it's easy to see where/how it's spreading and to rein it in if need be. But the truth is that it does not spread at unmanageable pace. In fact, I wish it spread and filled in a bit more quickly. 1. Zzzzzz.... Yeah, there's that pesky dormancy period. Buffalo grass is not the only grass to go dormant. 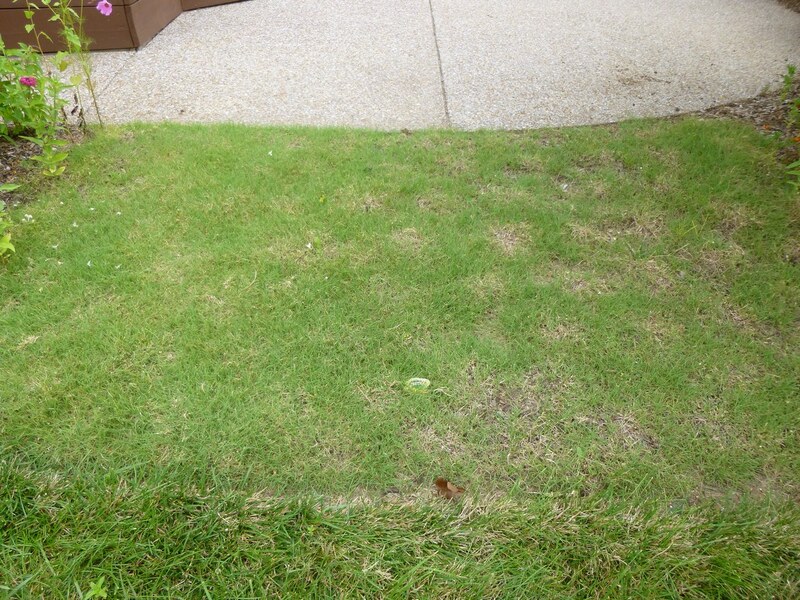 Zoysia also has a dormancy period, for instance, as does Blue Grama Grass. Anyway, the problem for me was that weeds (and Viola tricolor) took advantage of that dormancy period to establish themselves among the Buffalo grass bunches. You can see what the dormant grass looked like as late as early April by scrolling down through this archived post. And even when the Buffalo grass greened up and filled in late in the spring, a number of the weeds still coexisted alongside the grass. So, is this a dealbreaker? I'm not sure. I'm eager to see whether the dormant Buffalo grass does a better job at resisting weed invasions now that most of the clumps have knitted together. Stay tuned for another update in late 2013 or early 2014. Regardless of the weed invasion, the long dormant period was not particularly attractive, but maybe it will look better with an unbroken golden carpet this fall rather than the isolated tufts I had to look at last winter. I'm trying to keep an open mind. 2. The Swiss Cheese Effect. So Buffalo grass has filled in, but it has not filled in completely. There are still some bare patches, particularly in the shadier spots. Folks say that Buffalo grass loves the sun and apparently they're right. 3. The Net Effect. The interlocking stolons of Buffalo grass form a kind of net that seems to help it block a lot of weeds, but when a weed does get in there, it's pretty hard to pull it without ripping out a lot of Buffalo grass stolons in the process. 4. The Cost. I ordered my Buffalo grass plugs from Todd Valley Farms. I think one tray cost about $62 including shipping. That tray covered an area that is maybe 50-square feet. 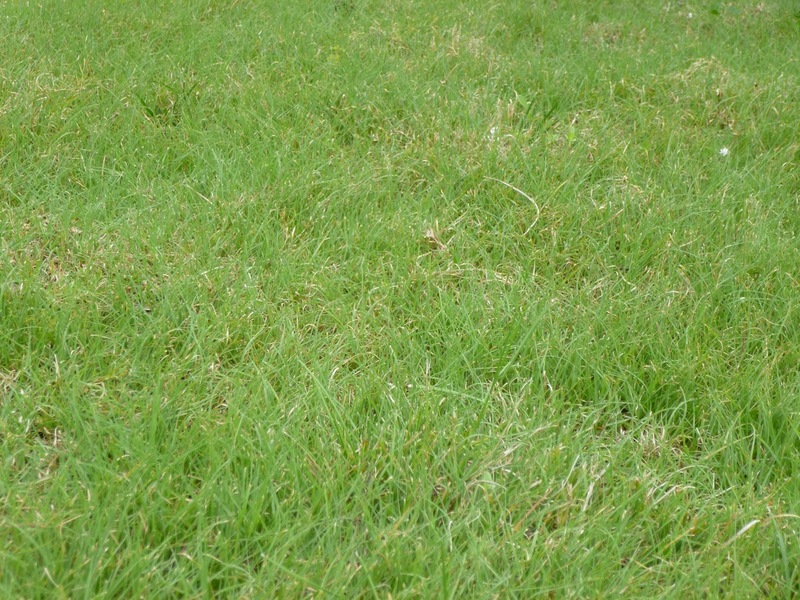 So if you've got a big lawn, you're looking at a lot of moola if you want to cover the whole area with Buffalo grass. 5. Brown Spots. Even where the buffalo grass has filled in nicely, I can still see brown spots. Is it the dead/dormant spots from last winter? What's going to happen this winter when the whole patch goes dormant? Will there be brown and green intermixed throughout next spring? Beats me, but I'll update you as soon as I know. I'm happy that I trialed buffalo grass and I think it's an interesting, beautiful groundcover with some significant advantages over traditional lawns. Unless I win the lottery, I can't imagine spending the money to cover an entire lawn with buffalo grass, but I could see using it again in the future for a small space. I look forward to seeing how it will perform in its second winter and how it will green up next spring. If it gets stronger and more established, I'm curious as to whether it will become more aggressive at invading the flower beds and the fescue lawn, or whether it will stay mild-mannered and let me keep it in check. Stay tuned for future updates! If you have any questions about your current or planned buffalo grass lawn, please leave a comment below and I'll try to provide answers!